Apple [Plum?] Pudding. (52.) Take nine ounces of grated bread, bits of apples chop'd fine, nine ounces of currants, and eight ounces of clarified butter, a little Salt and nutmeg, mix all these well together, add a little brandy. It will take three hours boiling. To make Fritters. (53.) Take two eggs one spoonful of yeast, a little sugar and nutmeg, a pint of cream, and flour to make them thick enough to drop them, you may add currants and apples to your taste. Ground rice Pudding. (54.) 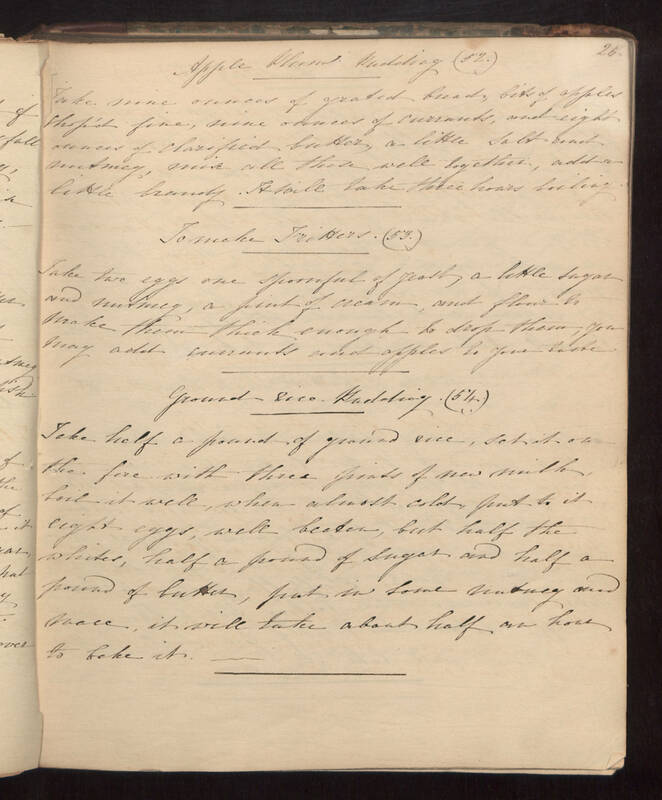 Take half a pound of ground rice, set it on the fire with three pints of new milk, boil it well, when almost cold, put to it eight eggs, well beaten, but half the whites, half a pound of sugar and half a pound of butter, put in some nutmeg and mace, it will take about half an hour to bake it.